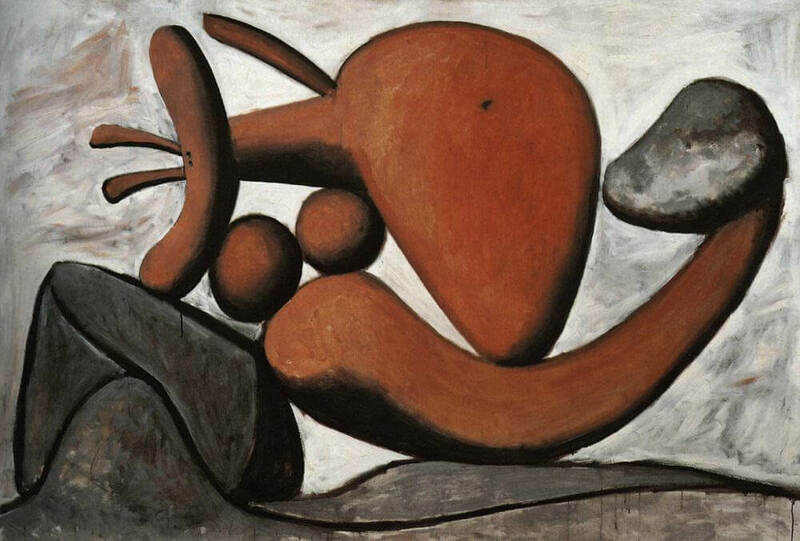 In Woman Throwing a Stone, 1931, Picasso takes simplification and abstraction - and therefore painting per se - even further. The forms have become difficult to identify: the breasts and triangular belly are recognizable enough, even though there are no realistic indications, but it is hard to make out the head, which has become a sort of phallic shape with antennae, and the arms and legs present even more of a puzzle. A preparatory drawing in one of the sketchbooks shows that the head was more pronounced in its original form. The mineral character of the body is accentuated by the presence of the boulder and the stone, with which it merges. The monolithic forms assembled in a wonderfully precarious equilibrium make of the female body something like a dolmen, and the huge arm holding the stone gives the construction the appearance of a catapult. Gone are the sunny naturalistic settings of previous years, the beach and sea having given way to an abstract, greyish-white space whose texture has a strong pictorial presence. Only the title remains as a reference to conventional reality. Woman Throwing a Stone contains a wealth of pictorial and suggestive possibilities: the arabesques of the rock counterbalanced by those of the body, the convoluted form, the suppleness of the volumes, the pinkish and stony-grey colours. The figure and its space have been rendered ambiguous solely by painterly means, and the result is as disturbing to the eye as it it to the tactile sense. Picasso here announces the bold and sketchy manner of the 1970s: rich impasto, plastic paintwork, drippings, and visible brushwork.